Background. Spotted wing drosophila (SWD) is a gnat-sized fruit fly first found in 2008 damaging fruit in many California counties. (See pictures and damage from 2011) Unlike the common vinegar fly that attacks rotting and fermenting fruit, the SWD infests ripening, undamaged cherries as well as ripening raspberry, blackberry, blueberry, and strawberry crops – especially in coastal areas. At the Fair Oaks Horticulture Center (FOHC), no SWD damage was found on the multi-grafted cherry tree prior to 2011. In 2011, the early varieties escaped damage, but the later varieties were totally infested. In an attempt to prevent fruit loss in 2012, and to demonstrate to gardeners a possible cultural means of preventing infestation, Master Gardeners in the FOHC orchard group decided to tent the tree. The Tent. Master Gardeners Mary Kay Ryan and Patty Peterson designed a structure to cover the tree while still allowing the harvest of five varieties of cherries ripening at different times. The tree was pruned to just under 10 feet. They used 1” schedule 40 PVC to create a large box frame anchored to the ground at the corners. 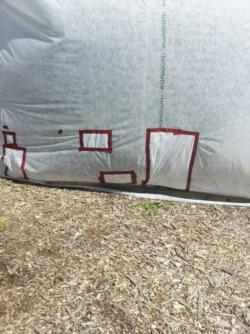 The tent itself, which was 13.6 feet wide, 13.6 feet long, and 10 feet high, was sewn using 30-weight Agribon row cover and included a 110” sleeping bag zipper to allow easy entry. Diagonal guy wires and PVC clamps ensured the tent would not slip or be pulled due to winds. The bottom edge of the tent was weighted down. The tent was erected 4 weeks prior to the first harvest. The cost of the tent: approximately $200. Traps. One SWD trap was placed outside the tent, and one trap inside the tent to monitor activity. A few male SWDs (with distinctive wing spots) were found in the outside trap during the season, but an exact number of males was not determined. No SWD males were caught inside the tent. Temperature Observations. Because we were concerned about heat build-up in the tent, two recording thermometers were placed in the canopy of the cherry tree 6 feet high under the cover from May 14 through June 19. Two additional thermometers were placed at the same height in a nearby uncovered fig tree of similar size. 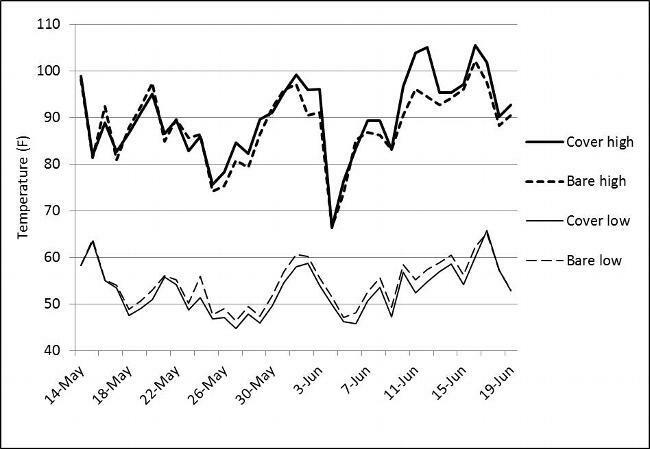 The low (nighttime) temperatures were on average 3 degrees cooler in the tree under the Agribon cover than in the uncovered tree (see graph). The high (daytime) temperatures under the cover were on average 2 degrees warmer than the uncovered tree. On days over 90F, temperatures under the cover were still only 2.5 degrees warmer, but during one 3-day period, temperatures averaged 8 degrees warmer. Harvest. While harvest was a bit challenging (quickly entering/exiting the tent as well as moving ladders during harvest in a cramped space), overall it was a success with a full crop of undamaged cherries. Other issues/drawbacks. 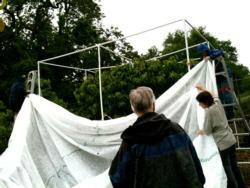 The size of the tent required a number of people, with ladders, to assist in its assembly. The tent did suffer some damage near the bottom – we believe from a raccoon or similar creature. Several tears appeared overnight but were quickly repaired. Additionally, the tent suffered some wind damage along the bottom edge. 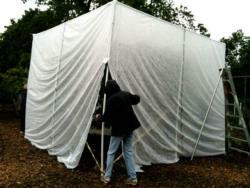 We originally used 2’x4’ boards to secure the tent bottom, switching to soil to prevent further tears. On the plus side, we were able to disassemble the tent relatively quickly and store the parts for next year. Conclusion. While our experiment was not scientific, we do think of it as successful in that we avoided fruit damage of any kind on a fairly large tree with varying harvest periods. It does provide another option for residents who may be dealing with SWD, and it can also double as protection from vertebrate pests. Although expensive initially, the cover should be reusable for possibly several years. In January 2013, we will espalier a cherry tree, and when the tree begins bearing we will secure row cover over it in the spring. This will provide demonstrations of both training and pruning on a trellis and a practical method of controlling SWD, since covering an espalier tree should be much cheaper and easier than a large tree. Holes appeared in the fabric on one side which were quickly repaired.